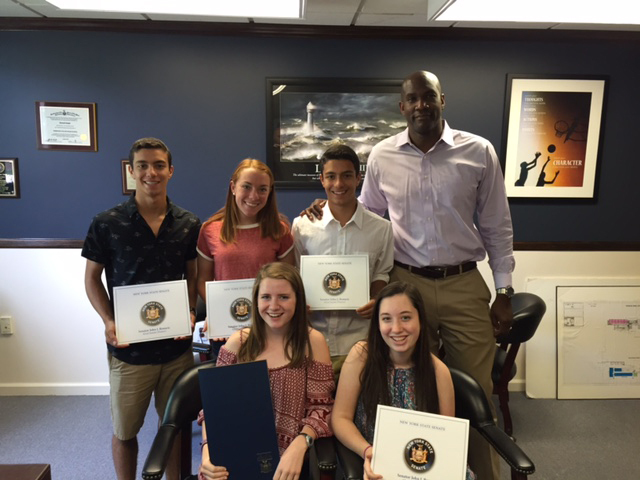 Nine Warwick Valley High School students recently received certificates of merit from State Senator John Bonacic for the New York State Senate Youth Leadership Recognition Award. The awards program recognizes outstanding young students who will become our state’s future leaders. They are students who are well-rounded, excel academically, and have exhibited leadership through extracurricular or volunteer activities. Current juniors and seniors are eligible to participate, and students must be nominated by a teacher, administrator, counselor or other school faculty member. Special recognition was given to Brogan Dineen, who was chosen from among student leaders across the state as the overall winner for the 11th grade in the NYS Youth Leadership Recognition Awards Program. A resolution sponsored by Senator Bonacic was adopted by the New York State Senate recognizing Brogan for her achievements. Congratulations to all of our student-leaders! Standing, left to right: Thomas Nafash, Jenny Prial, Jason Nafash, and WVHS Principal Dr. Larry Washington. Seated, left to right: Brogan Dineen, Molly Little. Not Pictured: Bryn Brockunier, Danielle Cheney, Andrew Warren and Amanda Capiaghi, who also received certificates.